Should You Get a 401k Loan? For many consumers, one of the biggest repository of assets is the retirement account. Even if you have a house (which is also a large asset), the 401k might be a little more accessible. When you get a 401k loan, you access relatively liquid funds, and this type of loan allows you to pay interest to yourself. Normally, when you withdraw money from your 401k early (before age 59 1/2), you have to pay a 10% penalty to the IRS. On top of that, the amount that you withdraw is considered income, and you are taxed accordingly. But if you take the money out as part of a loan, it’s a different story. Instead of finding yourself paying penalties and taxes, a 401k loan can help you get the money without extra costs beyond those that are normal for any loan. You usually have to pay an origination fee, and you will have to pay interest. The good news about the interest is that you pay it to yourself. While the origination fee goes to someone else, the interest that you pay goes back into your account when you make your payments. It’s possible to arrange to have your repayment made through automatic means from your paycheck, which can also be a big help. You usually have five years (although terms vary) to repay your 401k loan. Of course, even though borrowing from your 401k has points in its favor, there are also downsides. First of all, if you don’t repay your loan in the required time period, it’s considered an early withdrawal, and taxes and penalties apply. Another thing to be aware of is the fact that if you quit your job, or if you are laid off, your 401k loan becomes due — no matter what the original repayment terms were. You usually have between 30 and 90 days to pay back the entire amount or it is seen as a withdrawal that results in taxes and penalties. Another problem with borrowing from any retirement account is the issue of lost opportunity. Once you take that money out of your account, the capital is no longer there earning interest on your behalf. This means that you miss out on the time that your money could have been working for you. Even if each of your payments on the loan results in interest paid back into the account, you still miss out on the time that your money wasn’t in your account, earning interest. There is no way to replace that time. 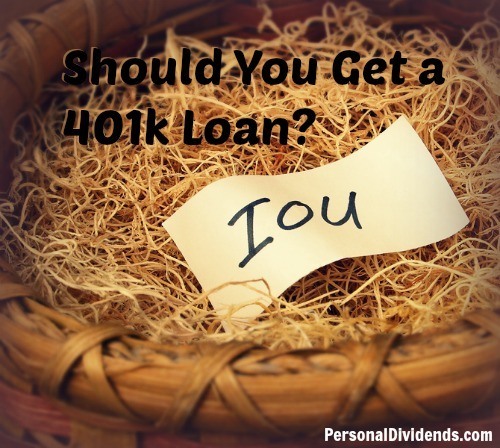 In fact, it’s often best to avoid using a 401k loan unless you have no other choice. Too many things can crop up to prevent you repaying what you owe. Additionally, you could find yourself missing out on opportunities to grow your wealth. Essentially, taking a 401k loan now means trading the future for today. Unless you are really in a bind, it just doesn’t make sense to borrow from your retirement account. If at all possible, keep that money where it belongs — building wealth for your future. Yeah, it’s that deal with the loan quickly becoming due in full if you leave a job or are laid off that I think really makes a 401k loan a bad idea. There can be (rare) circumstances where borrowing from a 401k is the best option, but I think in general it’s best to leave that retirement fund for retirement! One situation where the loan makes sense – to raise a new home purchase down payment to 20% and avoid PMI. The addition cost of that, say, 10%, is the entire PMI monthly cost along with the integrate rest charged. The money saved by using the 401(k) loan can be an effective 15% (or higher) return. Risk is relative, and this should only be considered by those with high income who have decided to buy a home but don’t have the 20% to put down.